On January 25th, I attended the premiere of Sarah Koteles’ latest project White Wolves. A short film about the pain of loneliness and the power of new beginnings, the film takes place against the fascinating backdrop of the surfers world. As a surfer myself, I was struck with the both the relatable subject matter and the gorgeous water cinematography. Admittedly, this was my very first premiere… of anything! I guess you could count my high school graduation as my own personal “premiere into adulthood,” but we all know that adulthood doesn’t really start until the mid to late 50s. And so it was with wide-eyed anticipation that I arrived at the premiere in a button-down shirt and a spot jacket (that was really just the jacket from my wedding suit). After a pre-show mixer with delicious surfer-themed adult beverages and authentic tacos catered from a local restaurant, the premiere began. The first project was a short documentary feature about a surfing program for disabled youth that grew from a small core group to a massive and inspiring all-day program a few years later. It was fascinating to watch the joy of surfing infect a whole new generation. Learning how to pop-up, paddling in the ocean, and celebrating the joy of surfing was wonderful to watch and vicariously experience. The second project was a short film titled Haircut. A story of a young woman who dramatically cuts her hair into a short, stylish look to the consternation of her bombastic, hipster-esque boyfriend. A change in style quickly devolves into an argument, which devolves further into sniping and angry comments, and finally ends at the declarative statement: “I think we should break up.” Over hair!? But it’s revealed that the young woman didn’t actually cut her hair. In a dramatic reveal, she pulls back the short-haired wig and stares forlornly into the mirror. Her boyfriend is just as shallow as she feared, and his response was just what she hoped it wouldn’t be. In sorrow, she runs her fingers through her hair, grabs a pair of scissors, and cuts it. This time, for real. Finally was the premiere of White Wolves, the main event. The big show. The tentpole. Opening with amazing ocean cinematography (shot in the water by the DP), the film moves into a serious introspective piece about the nature of relationships, and the struggle to overcome the lingering fear left over from the end of something as important as a life-defining engagement. With the wise words of a mysteriously vanishing older surfer, and the support of his bubbly, outspoken friend Jimmy, Josh (the aforementioned White Wolf) slowly opens himself up to a new, growing relationship with a woman he met at the ocean. With the pieces of his life slowly filling back together, Josh is finally able to face his own self-doubt and fear about the loss of his ex-girlfriend, and take an important cathartic step towards his own fulfillment. By far my favorite part of the premiere was the Q&A session afterwords with the cast and crew of White Wolves. As a glutton for inside knowledge and a voracious reader of IMDB Trivia pages, the chance to ask filmmakers specifics about their creative and technical processes was a dream come true. Thankfully, the rest of the audience felt the same way, and asked enough questions that my hunger for inside knowledge was satiated without having to stick my hand up like a third grader asking to use the restroom for the 5th time in 45 minutes. The crew was great, the cast was great, and most of all Sarah Koteles, the director, gave fascinating insight into both the physical processes of production and the creative work done to make a cohesive, narrative surfing movie. I walked out of the premiere looking on craigslist for surfboards. 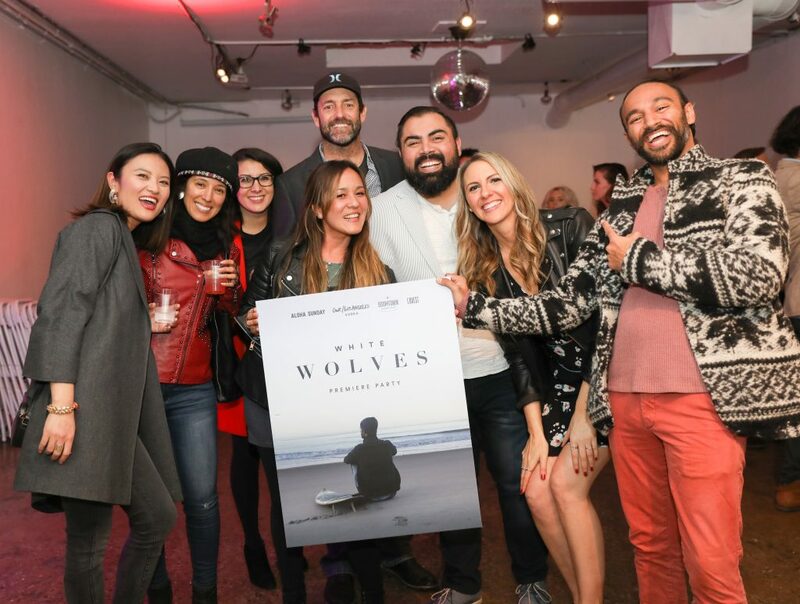 All in all, my experience at the White Wolves premiere was a wonderful validation of driving from Boston to Los Angeles to get as close to filmmaking as I could. It was here that I felt for the first time a community of artists and creators and writers and cinematographers that not only did great work, but enjoyed the process. There is no better feeling than sharing the mutual enjoyment of the cinematic art form with others. And I plan on attending every single event I can get an invite to.